Put the romaine in a large bowl. Dress with the olive oil and lemon juice. Add blue cheese, roasted red peppers, and red onion slices. Gently toss to combine the ingredients. Divide the salad between two serving bowls. 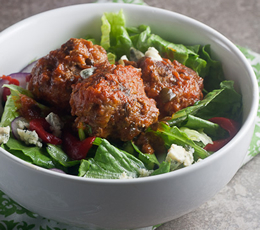 Top with meatballs.